Regular readers of this little newsletter pretty much know what to expect by now when they open each new issue. Is this a good thing (it's consistent and organized) or bad (maybe it's predictable and boring)? I don't know. In any case, this issue is different. I finished writing a couple of the stories, but when I came to the article introducing the craftsman I got a bit carried away, and it grew out of control. I ended up deciding to put the other stuff on 'hold' for a few months, and dedicated this entire issue to the one story. I hope you find it interesting and entertaining. When I reach the top, I find myself on a small landing onto which two rooms open, a large one at the front of the building, and a smaller one towards the rear. I stand there for a moment, uncertain which way to turn, and one of the men working in the front room beckons me to enter. Stepping through the doorway into the tatami room, about 12 mats in size, I see that four men, woodblock printmakers, are working here, their low benches all facing in the same direction, with the windows on their left hand. One of the older men says something to me in a quick burst of guttural speech. I can understand nothing. What language is this? Does he have marbles in his mouth? This is nothing like the Japanese I have studied for so many agonizing hours. But of course, why should I have expected my 'textbook learning' to have much relevance here, in a Shitamachi workshop full of tough old craftsmen? When he realizes that I cannot understand, he turns away and returns to his printing, tossing off some remark that brings a guffaw from the others. I stand hesitantly, unsure of how to proceed. One of the men is younger than the others, still only a teenager. He gets up from his working position and moves to the corner of the room where a small brazier stands, and proceeds to make tea for everybody. When he has served the other three, he gestures for me to sit down beside him, and offers me a cup. I assume from his age and his tea-making chores that he is an apprentice here, and it turns out that this is so, for to my relief I can understand some of what he says. He speaks to me slowly and carefully, and we establish communication. In another month he will have been here two full years, and he is eagerly awaiting the coming New Year holiday, for with the turn of the year another apprentice will be joining the group, and it will no longer fall to my new-found friend to make tea, run for tobacco, clean the workshop, and spend all those endless hours crouched over his mortar grinding pigments to the required fineness. Another of the men is working stripped to the waist, even on this chilly winter day. He is printing a 'tsubushi', a wide area of solid colour, and on thick paper this is hard work. 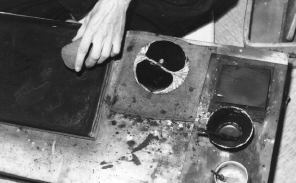 If the baren is not applied with full pressure across the entire area of the paper, the colour will be weak in places, and the print rejected. The huge golden carp climbing up the blue waterfall tattooed on his back is shiny with sweat, the muscles on his arms and chest bulge with the effort, and his contributions to the conversation are limited to the occasional grunted interjection. At one point one of the men asks me about my purpose in coming here, and I explain that I have come to see Inoue-san the carver. In my involvement with the printing crew here, I have almost forgotten about that other workshop across the landing, and the young apprentice now takes me through to introduce me. The windows of this room face south, but as there is no sunshine today a lamp stands by each of the three benches throwing soft light over the work in progress. These are the carvers, the men who produced those woodblocks that are being so vigorously utilized in the other room. As we enter, two of the three men look up. A middle aged man sits nearest the door, and next is a young boy who could be the twin of my apprentice friend. Behind them, head bowed so low over his bench that his nose practically touches the block, is the man I have come to see today, Inoue ('ee-no-oo-eh') Shinshichiro, master Ukiyo-e carver. The carvers' benches stand higher than those of the printers in the other room, and are sloped slightly toward the workers, while the printers' are sloped away. 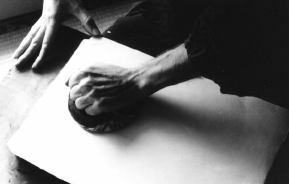 Inoue-san's left elbow rests on the polished desk surface, the hand lying open on the woodblock, the middle finger extended, acting as a guide for the knife blade inching its way through the wood. He is oblivious to our presence, and we say nothing to disturb him, but merely stand and wait for him to pause. The block he is carving is of typical size, about 280 by 400mm, but the design on its surface seems a bit unusual. The block has been divided into two areas, and each carries a standing figure in kimono, bordered by an outline. This is not to be a single sheet print, but a leaf from a book. This block carries two pages from the book, and after carving is finished they will be printed together across a single sheet of paper, which will then be folded to put the images back to back, and sewn together with other similar sheets into the complete book form. The printer's apprentice tells me about the book. They have been working on it for nearly two years now (among other projects), having started sometime early the previous year. It is a collection of poetry of special interest at the New Year season, and the carving and printing should have been finished some time ago, and the trimmed sheets sent downstairs to the women who do the binding. The book contains 50 of these double sheets, and Inoue-san is now working on the final page. As soon as he has finished the faces, the lettering, and a few other delicate places, he will pass the block over to the other carvers for finishing up. This is standard procedure, with the most experienced carver doing the 'kashira-bori' ('head carving'), and the younger men doing the 'do-bori' ('body carving'). There are almost no wood chips lying around Inoue-san's bench, as his work is on the millimeter scale, but the rest of the room is littered with the chips sent flying by the other workers' chisels. At last he stops carving, squints for a moment at the tip of his knife, and then turns his body sideways. I now notice a small oval wooden bucket sitting on the floor next to his cushion. 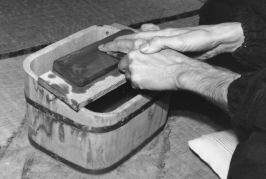 Resting on a small wooden board perched over the water is a dun-coloured sharpening stone, and Inoue-san now moistens this with a bit of rag tied to a stick, and starts sharpening his blade. His motions are difficult to describe in words. The stone is placed in a crossways position in front of him. One elbow rests on a knee, and acts as a pivot point for the forearm holding the blade, which is swept over the stone from side to side so rapidly that I see only a blur. It takes only a few seconds to restore the edge of the steel, and he swivels back to his previous position. Another, smaller stone sits on a corner of the bench, and he now hones the blade on this hard surface. This takes longer, and both sides of the blade get the treatment, being rubbed hundreds of times down the length of the yellowish stone. After a while, he is satisfied with the result, and placing the knife to one side, sits back casually and takes out his pipe. This is my cue, and I hesitantly introduce myself. My friend the apprentice stays and helps with the conversation, for again I find it difficult to understand. (My ability to communicate with these craftsmen seems to be in inverse proportion to their age.) Our discussion is not relaxed. Always I have found it so when talking to carvers, who seem much more reluctant to describe their work, sometimes almost secretive. The contrast with the printers I have visited, who to a man have been open, friendly and ready to offer advice, is quite marked. I am not able to learn much beyond the fact that he started the craft as a very young boy, spent about fifteen years as an apprentice, and over the years gradually became respected in the business. I have seen his work, and it is truly superb. 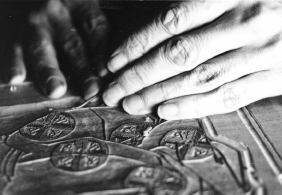 He is one of a small group of men who have set a new standard in woodblock carving. They are able to carve hair lines so thin as to be almost invisible when printed, lines which do not vary in their thickness by the slightest trace, and kimono lines which flow across the page - the famous 'singing line', the hallmark of good Ukiyo-e. I ask him to tell me something of his thoughts on his work, but nothing comes of it. Just like most of his co-workers, he doesn't seem to be interested in much of anything other than the block on his desk. The book he is currently carving is very interesting to me, but when I try and elicit some of his thoughts on its artistic merits, I draw a blank. I have encountered this attitude time and again in visits with 'shokunin'. Their approach to this work is completely opposite to mine. I want to know everything. I want to do everything. They, on the other hand, have narrowed their focus to an extreme. Inoue-san is not even interested in seeing a copy of the finished book... But can he carve! Inoue-san begins to get restless and I take the hint. He is eager to get back to work, so I close the conversation, but ask if I can stay for a while and watch. I get neither assent nor denial, but when my young printer friend heads back to his work, I remain seated off to one side, trying to make myself as inconspicuous as possible. I spend the rest of the afternoon sitting there, drinking in the scene - trying to fix in my mind the atmosphere of the room, the rhythmic tapping of the mallet wielded by the youngest carver, the scrape, scrape of the chisels, the gentle tearing sound made by Inoue-san's knife as he pares away at the wood. For me, learning what I have of woodblock printmaking by working essentially alone, a chance to hear the rhythm of this work is truly a gift. Later, back in my own workshop, I will try to recapture what I can of what I have seen here today. At last it is time to leave, and I make my hesitant apologies for disturbing everybody. Back in the printers' room lamps have now appeared, and it seems that everybody is settling in for at least a few more hour's work. The goodbyes here are a little warmer, and it is with real regret that I start down the stairs. The shop is still open, with a few customers browsing through some stacks of prints on display. These too I would love to see, but time is short and I reluctantly leave and head for home. It has been a wonderful day. I have picked up dozens of useful tips and techniques, but probably more importantly, have 'recharged my batteries' through the contact with these craftsmen. I am eager to get back to my own work, and when I wake in the morning, I will head straight for my carving bench. Breakfast will have to wait. The memory of Inoue-san's delicate yet confidently carved lines will hang in front of my eyes as I pick up my own blade, gently press it into the wood, and start to work. As the camera had not yet been invented in the winter of 1774, the time of this visit, the photos accompanying this little story were taken at here in my own workshop in modern Tokyo, this winter - 1991. Here we are again, at the end of another year of printmaking work. It's common to hear people talk about how fast the years zip by as one gets older, but I honestly can't say I'm finding that to be the case. I am now preparing for January's annual exhibition, and it seems like an awfully long time since I last did that. Then again, when I look back on the work of the year: 10 'Hyakunin Isshu' prints, a print for the children's printmaking 'workshop' at the annual town culture festival, a New Year's card, 14 newspaper articles written, four complete issues of this newsletter written, edited, typed-in, and pasted-up, appearances on four TV shows, and interviews for three magazine features and a dozen or so newspaper stories, I guess I can see why .... It has been a very satisfying year. To the readers of this newsletter: I hope you have found it entertaining and informative this year. To the collectors of my prints, patrons of this project: thank you very much for your continuing support of my work and my family. Without you, none of this would be possible, and I will continue to try and produce for you the best prints that I possibly can. I feel a bit sad for you ... surely there's no way you can be enjoying this as much as me! Thirty down - seventy to go!